Distributed by Wm. R. Forder Souvenirs, North Bay, Ont. 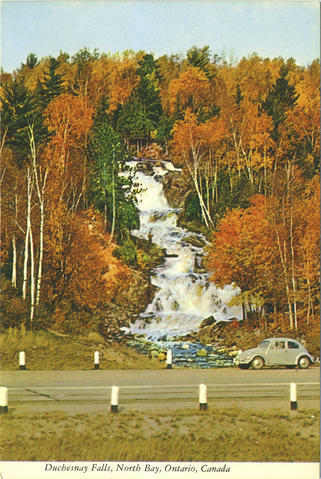 Description on postcard back reads: NORTH BAY, ON. "GATEWAY OF THE NORTH" This popular waterfall is called "Sheeney" Falls by the local residents. It is located beside Hwy. 17 at the western approach to the city. In Autumn it is particularly attractive when Mother Nature wraps it in a garland of colour.